SculpSure Body Contouring treatment is the world’s first FDA approved light-based laser lipolysis. This body contouring fat removal treatment permanently reduces stubborn fat that seems resistant to diet and exercise. 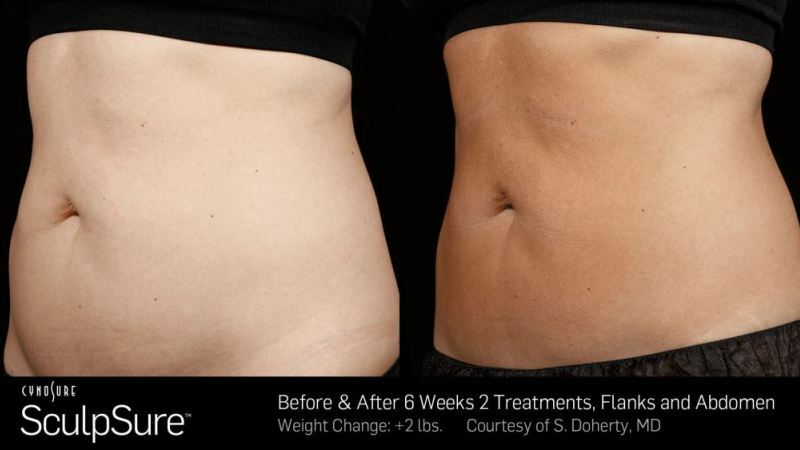 SculpSure helps you to achieve a slimmer appearance in just 25 minutes without surgery or downtime. 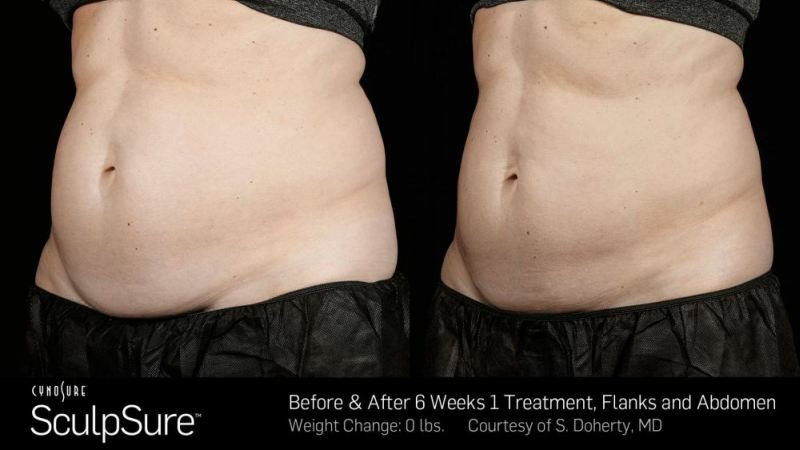 SculpSure’s innovative technology uses a laser fat removal process to permanently destroys treated fat cells in problem areas such as the abdomen, love handles, arms, legs, back, bra line and more. Results can be seen in as quickly as 6 weeks, with optimal results usually seen in 12 weeks. Remove 24% fat in a single treatment - Permanently! Treatment areas include: Arms, Legs, Stomach, Love Handles, Back, and more. The New SculpSure system treatment plan is specific to you and your areas of concern. During your initial consultation, a SculpSure treatment plan and package options will be customized specifically for you. Your first visit will consist of a thorough consultation where together we will gain a clear understanding of your expectations and goals for change. Our certified SculpSure experts will examine the areas you would like treated, begin a digital profile and discuss a recommended treatment plan to achieve superior results using our patented fat removal without surgery process. We will then schedule your treatment or treat you on the same day if desired. *Please ensure that you have not had any sun exposure in the treatment area for 7 days. First, we will mark your treatment areas and place the laser applicators. At the start of your treatment you will feel a cooling sensation and then an interval of gentle heat. Alternating cooling and intense deep heat will continue for your 25-minute treatment. The cooling process protects your skin while the energy heats your fat layer. Most clients will experience a sporadic tingling sensation that is easily tolerated. You may also experience cramping or squeezing sensations. During the treatment, you can take some time for yourself to relax, or receive another facial treatment. After your treatment, you can immediately return to work, exercise or other daily activities. There are no lifestyle restrictions following treatment. 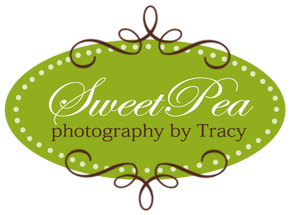 Some clients may experience some mild tenderness, swelling, or hardness to the treatment site. During the first 10 days, post treatment, we recommend you massage the areas you had treated 2 times a day for about 5-10 minutes. Most patients start noticing results in as soon as 4 weeks after their treatment as the body begins to eliminate the destroyed fat cells. Optimal results of up to 24% reduction are typically seen at 12 weeks. Those destroyed fat cells will be gone forever! Multiple treatments may be necessary if your goal is to reduce more than 24% in a given area. Sculpsure and Cool Sculpting are the only two FDA approved body contouring treatments which permanently destroy fat cells. After much research on body contouring systems, Dr. Doucet chose Sculpsure for several reasons. SculpSure is the newest technology and uses Laser Lipolysis which is safer for the patient and produces a smooth result while Cool Sculpting uses Cryolipolysis (freezing) that can lead to complications, post treatment discomfort and uneven results. Also, SculpSure is more efficient than Cool Sculpting because more areas can be treated in less time. Sculpsure has no downtime with virtually no side effects. Cool Sculpting patients report bruising, swelling, redness, numbness and discomfort for two weeks or more. Following a SculpSure treatment, patients can go directly to the gym for a workout, to the beach or resume regular activities immediately with no visible evidence in the treatment area.